Two Tone and Ska return to Bedford later this month for one special night in Bedford. The original rude boy Neville Staple from The Specials comes to Bedford Corn Exchange for the annual St George’s Day show on Friday, April 25. Neville’s solo tour features a selection of The Special’s back catalogue including Gangsters, A Message to you Rudy,Monkey Man, Ghost Town and Nightclub along with tracks from his second band The Fun Boy Three. Alongside Terry Hall and Jerry Dammers, Neville Staple was at the centre of oneof UK ska’s most-loved bandswho had seven consecutive top 10 hits between 1979 and 1981. Following the massive Specials reunion back in 2009 to 2012 Neville has since left the fold and released a brand new album in the spring of 2014 Ska Crazy to rave reviews. Special guests for the evening are Ruts DC. They were formed in 1980 by guitarist Paul Fox, bassist John ‘Segs’ Jennings and drummer Dave Ruffy. 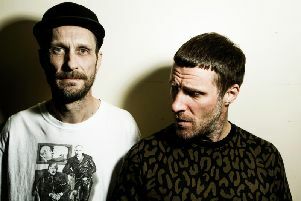 Their first album ‘Animal Now’ is regarded by many as a lost classic, whilst their ground breaking second release Rhythm Collision Volume 1′ saw the band collaborating with dub producer Mad Professor on an album that is still seen as a pioneering excursion into what was then a relatively unknown style of music. On the DJ front DJ Andy Attic from the Club Ska Sound system entertains the main auditorium while DJs Hammy & Geoff play Northern and classic Soul in the Howard Room 2, during and after the bands until 1am. Tickets are £20 in advance from Bedford Corn Exchange, seetickets, wegottickets or in person, with no booking fees, from Planet Boutique, The Arcade, Bedford, and Mario’s Hair Design, Kempston.